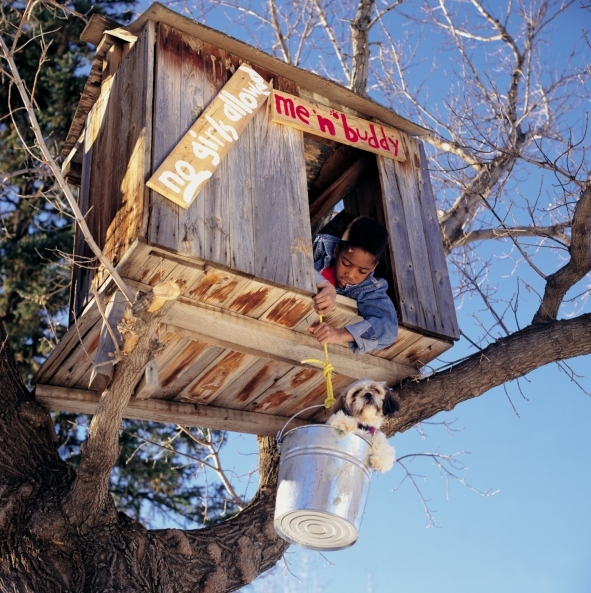 Researching, getting photographs and publishing this post on fun kid’s tree houses was a lot of fun because it brought me back to my tree house building heyday. You may also like our related posts on kids playhouses and backyard playgrounds. I grew up in a house with a large forest behind our home. Our yard had several large Maple trees configured in an ideal tree house formation. Our first tree house was built by our dad. It was propped up on a large stump and looking back, it was an elaborate structure with an enclosed area, porch, concrete footings and was built to last. We spent hours in that playhouse (and slept in it too). 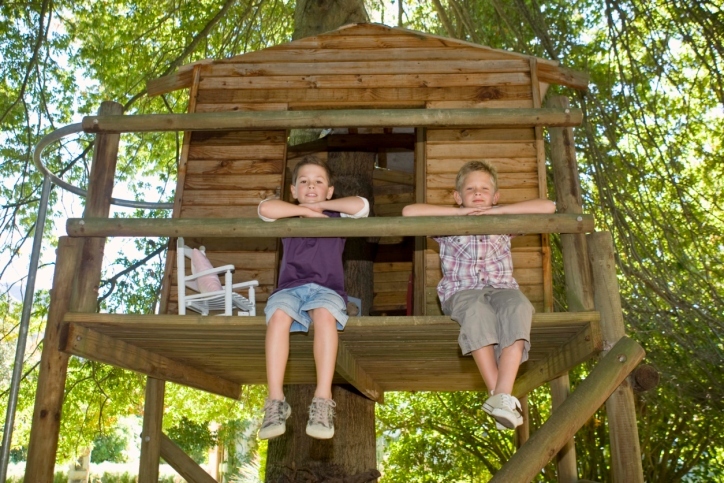 When my brother and I got a little older, we set out to build our own tree house (we wanted a multi-level tree fort). We got some wood and nails and started building… and building and building. 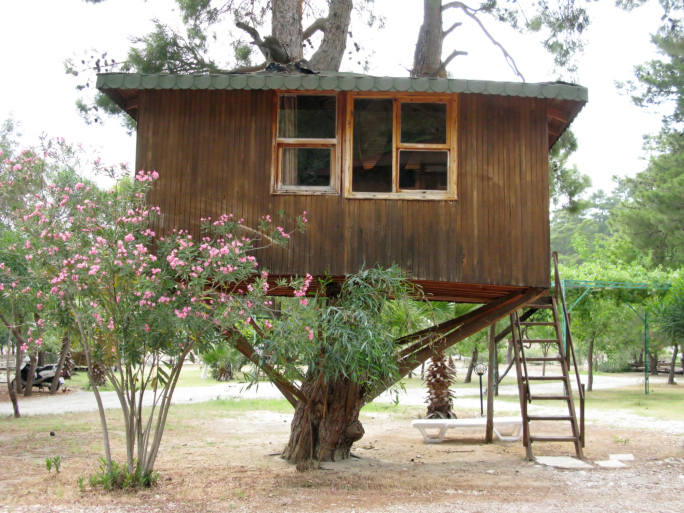 It ended up the Leaning Tower of Pisa of tree houses. It rose 5 floors (each floor was may 3 to 4 feet in height) with an unstable sundeck on top. It was ugly and very unstable, which was proven when during a wind storm, our own Leaning Tower of Pisa was blown off the tree and ended up in the ravine. We were sure fortunate not to be in it at the time. Not surprisingly, while my brother’s and my tree house crashed into smitherines, our dad’s effort stood strong (and safe). 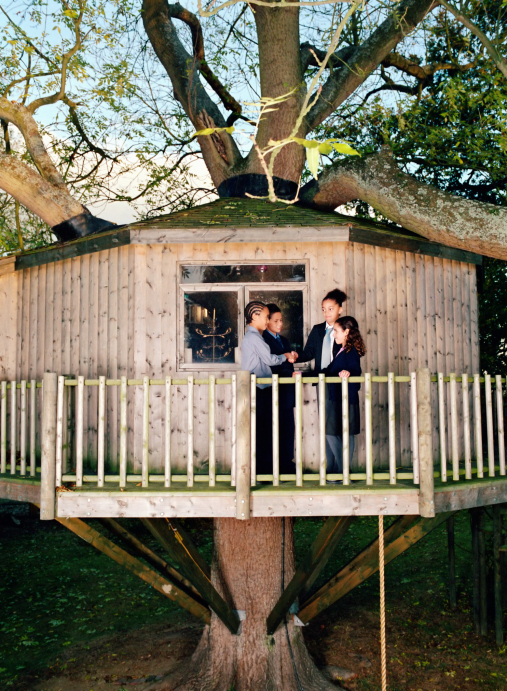 Building tree houses is a great way to spend time with your kids. I look forward to building one with my son when he’s older. The fun starts with building them and continues as a playhouse for years. 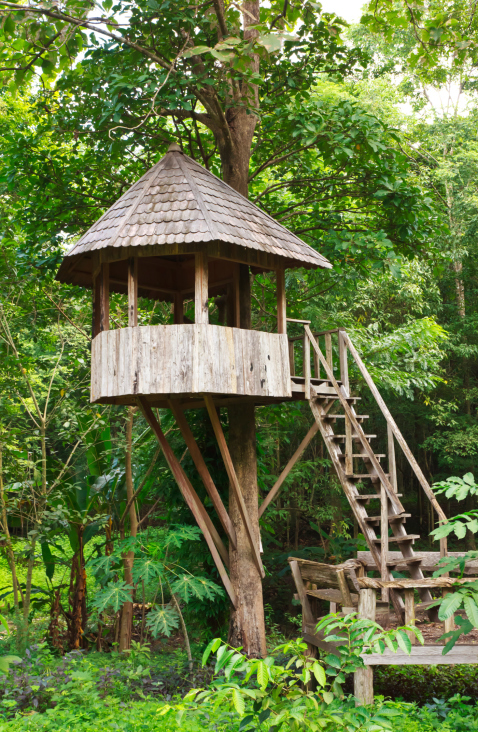 If you have young kids, they most certainly will welcome an elevated tree house or playhouse of some sort. 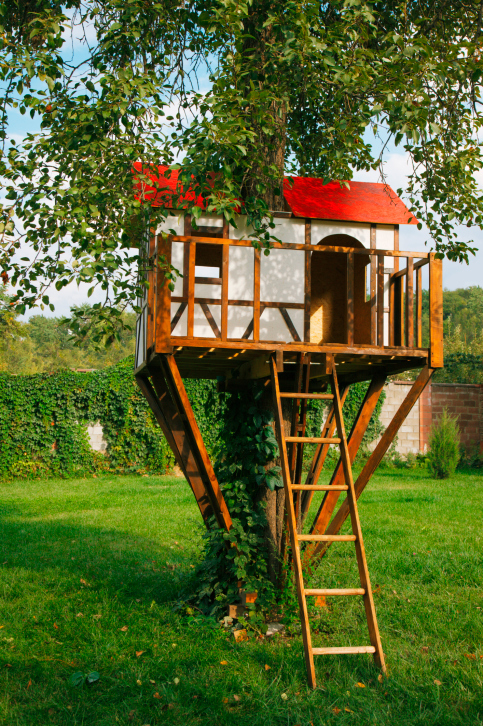 Here’s are 70 pictures of kids’ tree houses to get your ideas forming. Note, some certainly don’t look all that safe, while others are truly incredible structures high up in a tree. 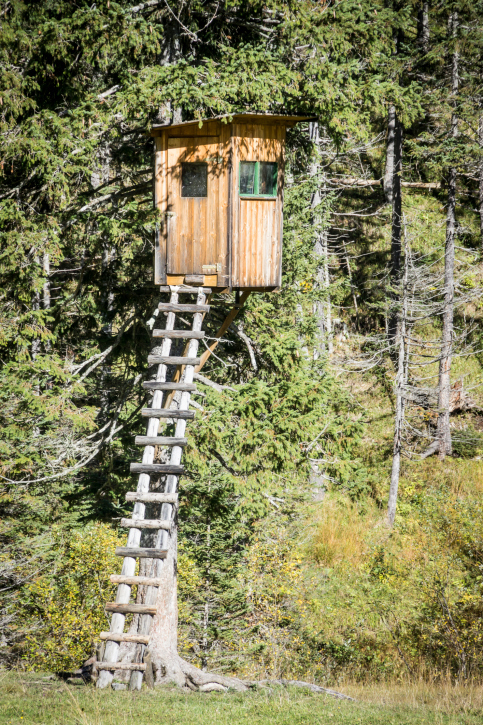 The tree house building dilemma: height vs. safety. As a kid, for me it was the higher the better. Now that I’m a parent, obviously, I wouldn’t get too excited about my son playing in a rickety structure 50 feet off the ground. 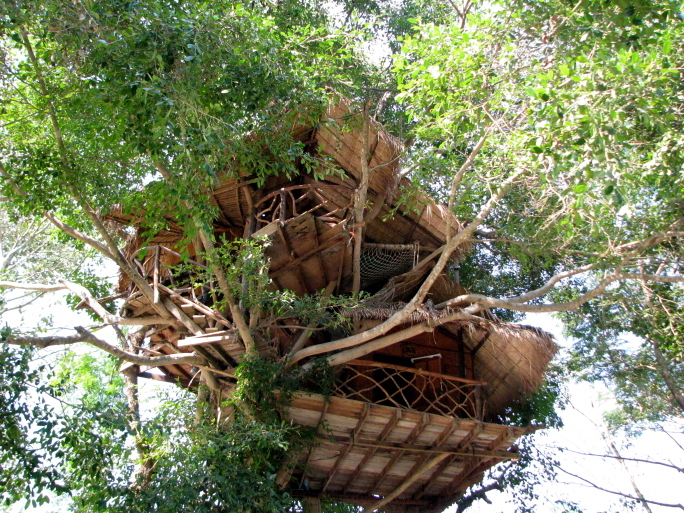 The following images provide examples of tree houses that are built way up in the trees and others lower to the ground. 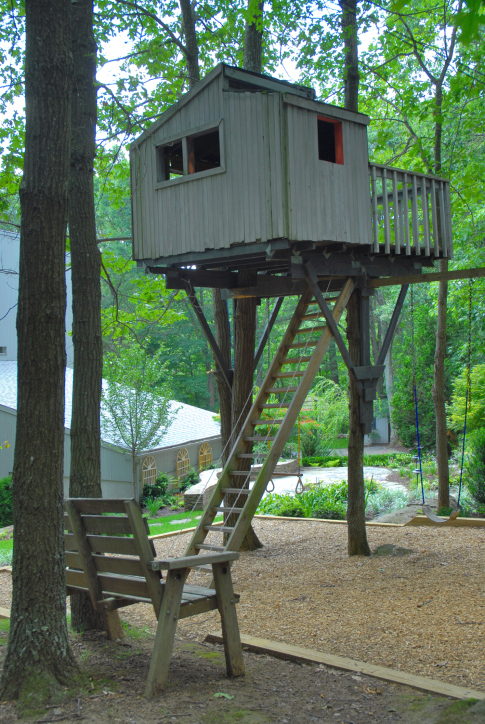 Note, if you don’t have sufficient trees in your yard, check out some of the options built on stilts (technically called a playhouse but because they’re elevated I included them in our tree house photo gallery). 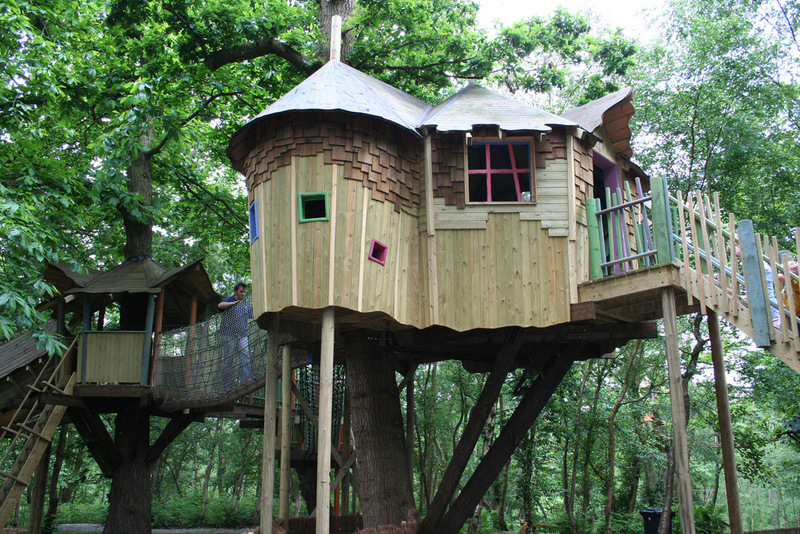 We hope you enjoy this gallery featuring some incredible kids treehouse and kids playhouse designs and ideas. Wooden tree fort very high up in a tree with small deck. Interesting octagon treehouse in backyard. Large treehouse complex with stairs, deck and and upper level deck. Large wooden treehouse with gable roof fairly high up in the tree. Beautiful soft yellow treehouses with small deck and windows. 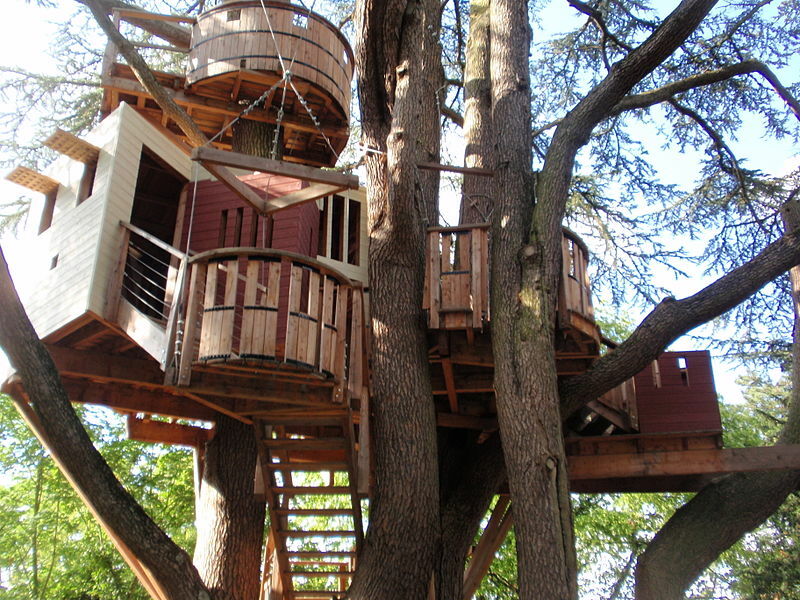 Large treehouse in large tree with round deck. Very nicely built modern-looking treehouse. 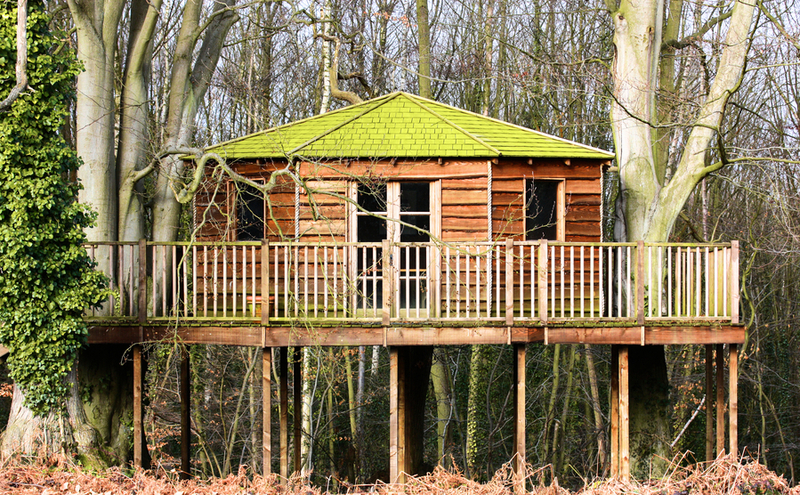 High up treehouse with large deck and bridge to deck platform. Small treehouse with shed style roof. Large 2-story treehouse built well enough that you could live in it. Large treehouse built up in tree with lots of foliage. 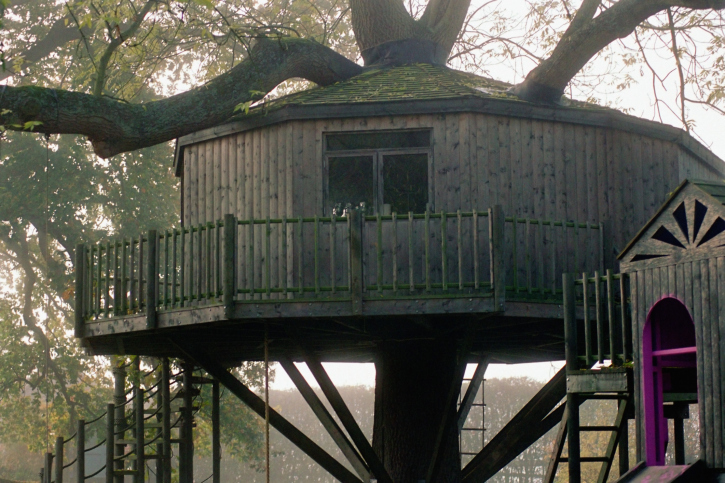 This is a truly beautiful, professionally built treehouse. Multi-colored treehouse with gable roof and small deck. Wooden treehouse with veranda style deck overlooking lake with winding staircase leading up to the deck. Thatch roof style treehouse elevated at least 20 feet above the ground. Small rectangle treehouse built very high up. 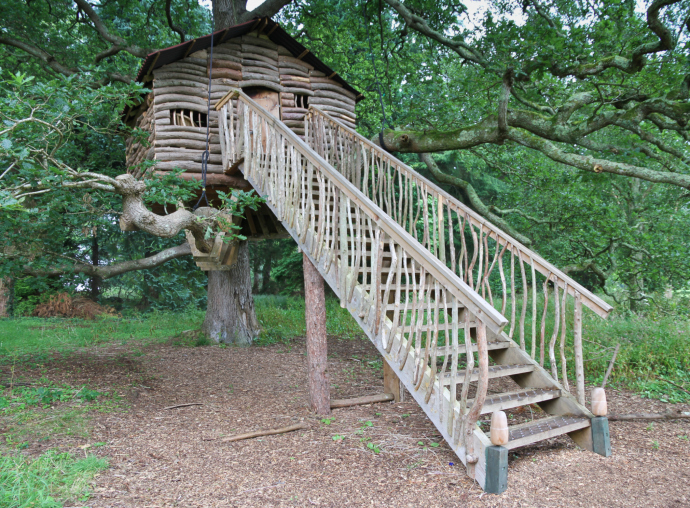 Well built treehouse with wrap-around deck and long straight staircase leading up to the entrance. Well built wooden treehouse with bridge to deck on nearby tree. Log style treehouse with deck and dormer window. Treehouse perched on top of tree trunk. 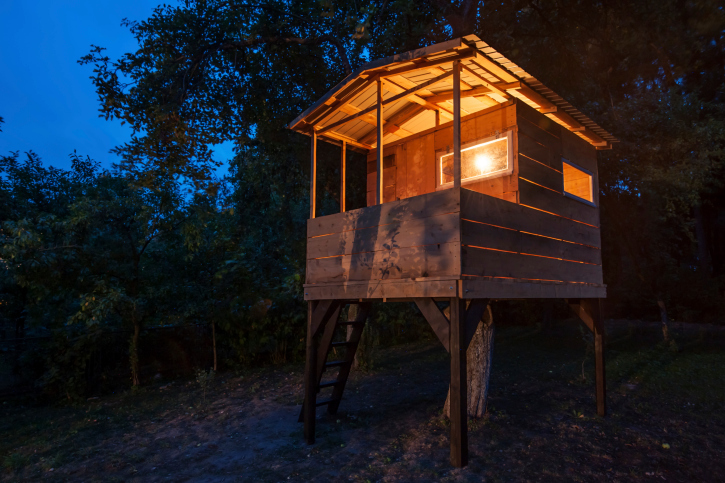 Square treehouse 12 feet above the ground in forest. 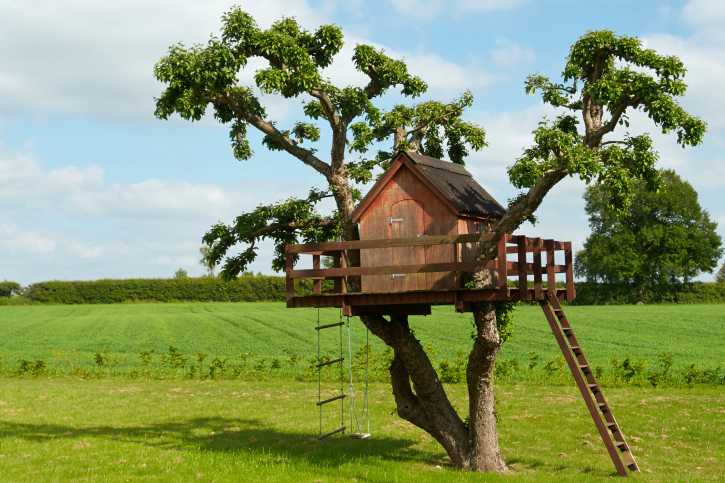 Professionally built treehouse with front deck and gabled roof in large multi-branched tree next to a barn. 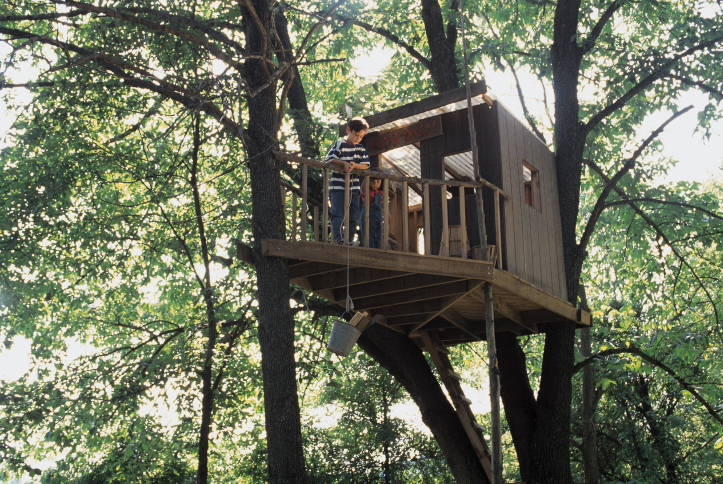 Small white treehouse built high up in large tree with suspended walkway. Vacation treehouses you can rent on the water. Small treehouse with shed style roof, window and large front deck with ladder that swings up and down. Custom built treehouse with real windows. 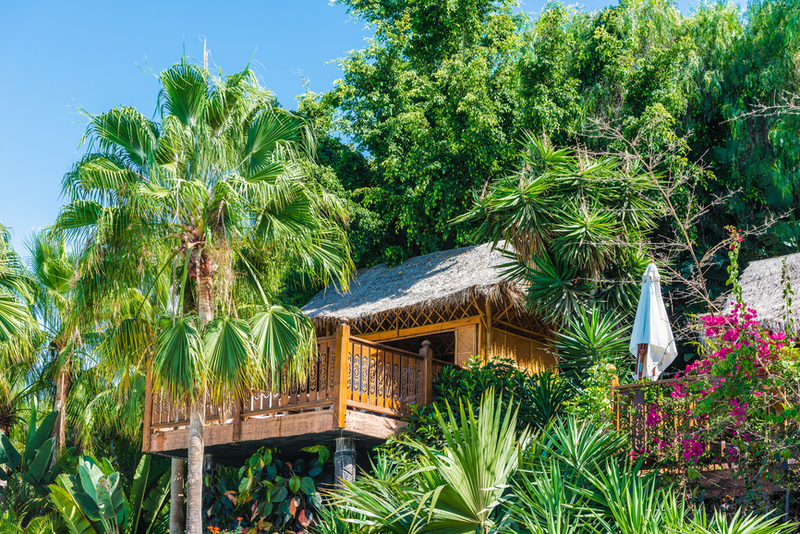 Tropical treehouse with thatch roof and porch perched precariously on stilt-like tree. Terrific kids treehouse in the backyard with window. 2-story kids tree house with wrap around deck. Small white treehouse with ladder and red roof. Very interesting crooked treehouse with interior space in the trunk of the tree. Quaint kids treehouse with real window and large deck up in a tree in the backyard. Tree house with multiple levels and decks built among two trees. Tree house built around one large tree and stilts. Includes small porch and windows. 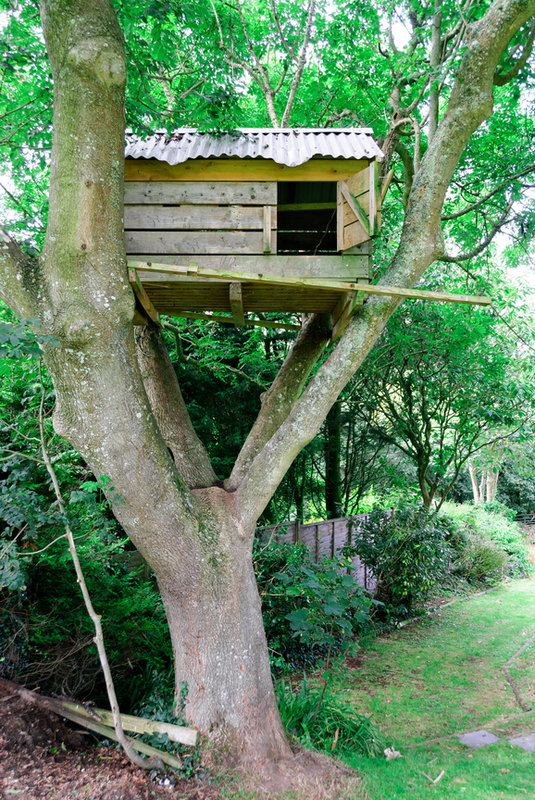 Incredible kids’ tree house built way up in the trees. 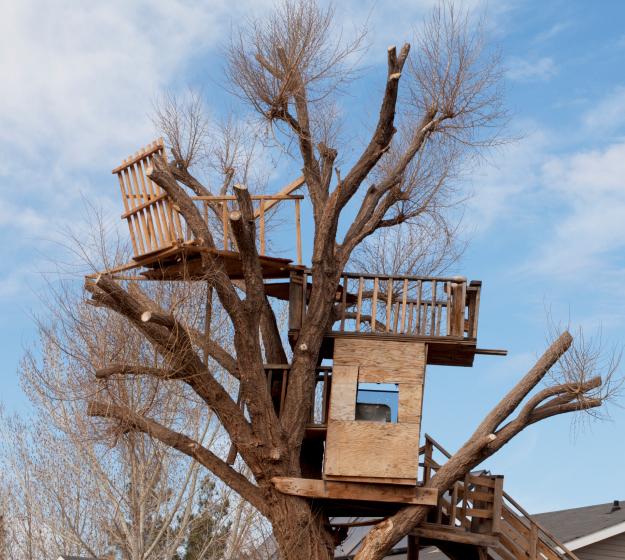 This is one professionally built tree house that any kid would love. It’s high up and well-built. 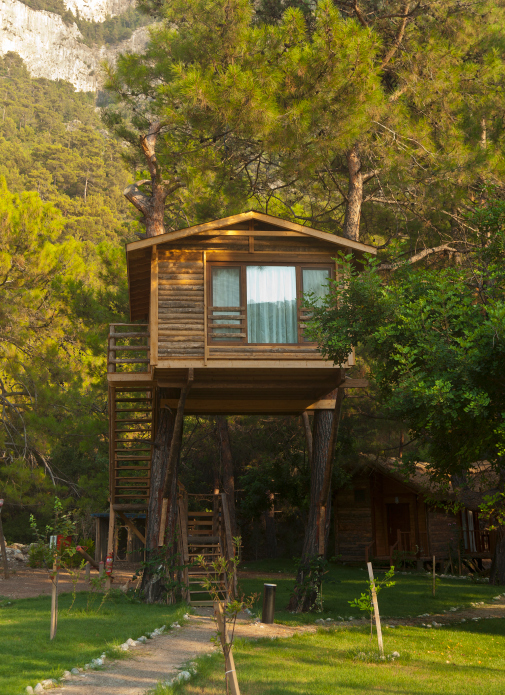 The above tree house is designed to coordinate and resemble the main home! 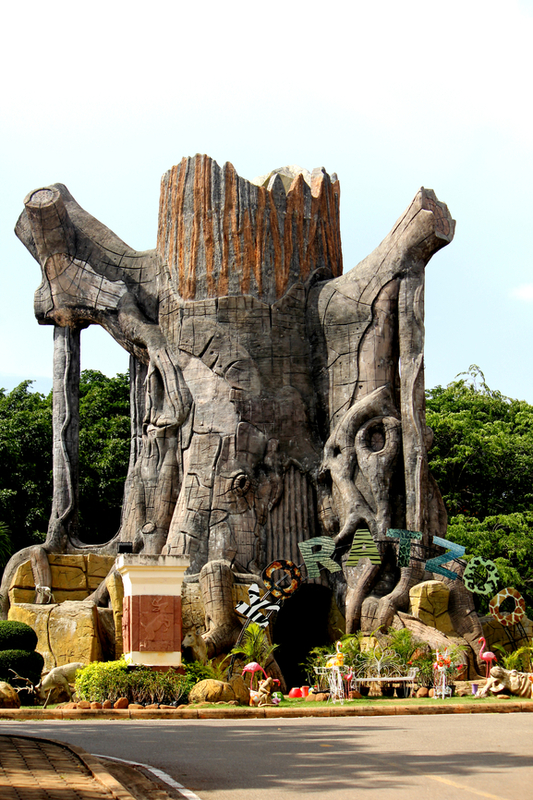 To view an impressive tree house that is an actual home, be sure and click here! Interesting tree house using a combination of trees and stilts. Includes a porch and windows. Very well built playhouse built on stilts with wrap-around porch. Two tree houses connected with swinging bridge. 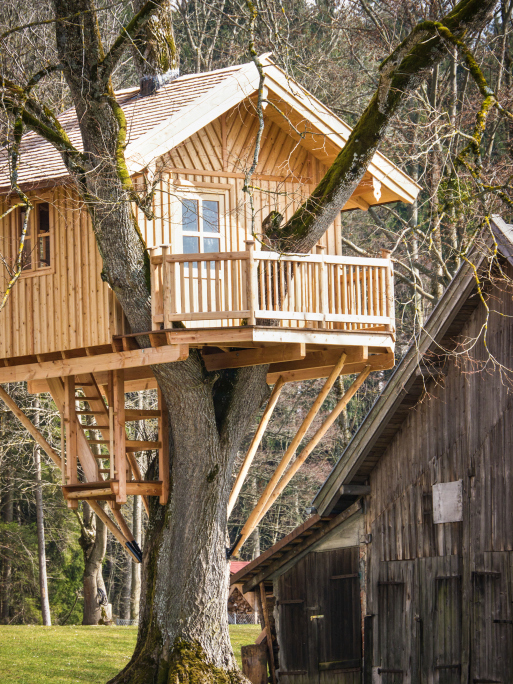 Great looking tree house built within the spidering branches of a large tree. 3-level tree house. This tree house reminds me of the one my brother and I built. It doesn’t look to be the safest, but it sure looks fun with being high up and having multiple levels and decks. Tree house fairly high up in a tree also using stilts for support. A tree house that could be for kids or adults. If it’s for kids, it’s truly a professionally built affair, but it could certainly be a home for adults (and a fun one at that). Spectacular and intricate kids’ tree house with porch and windows. With respect to detail and design, this is my favorite on the page. The only downside is it’s not very high up. Small tree house built high up in a tree. Low-level tree house with red roof. Elaborate log tree house with long stairway leading to front door. Check out the windows and how it uses branches for frames. The log walls look great. 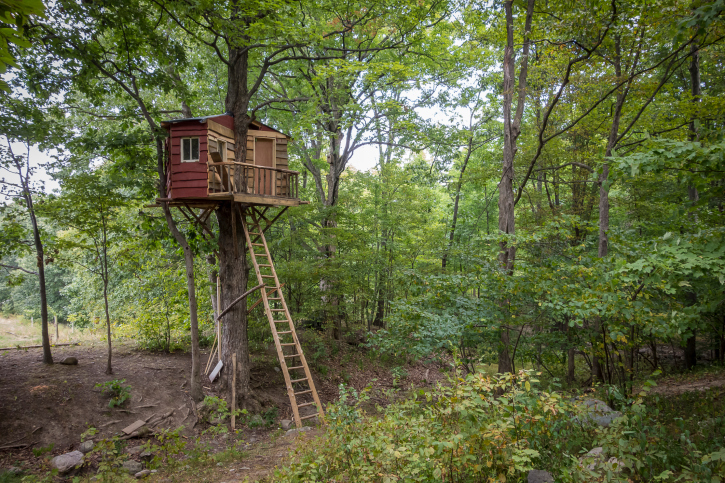 Large tree house built entirely on one small tree. Not many tree houses include a swinging door and window panes. Looking to make the most of your backyard space? 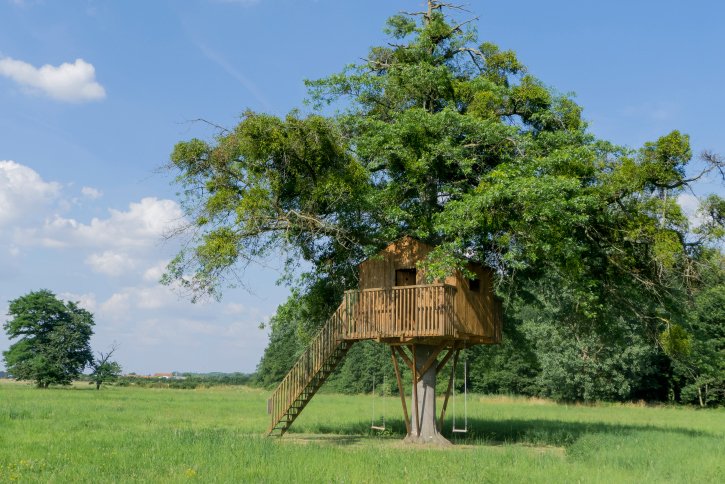 After you build your tree house, be sure and check out any number of our amazing galleries for more backyard inspiration! 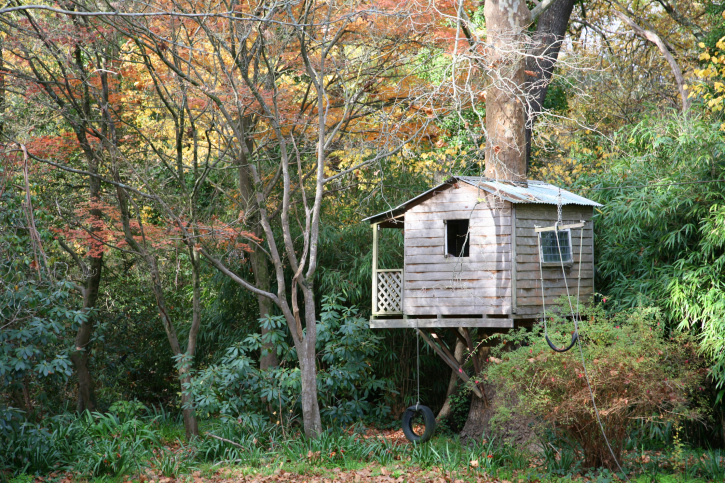 Small well-built tree house built around one tree with small porch. Bamboo tree house built in the crook of a large tree. 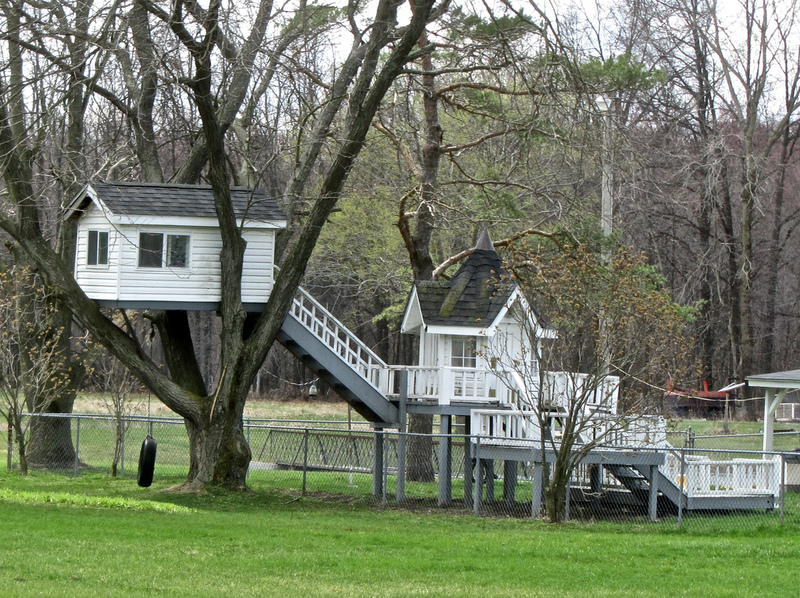 Two tree houses built in adjacent trees. One has a thatch roof. Round tree house built in one tree with stilts extending from the tree trunk for support. 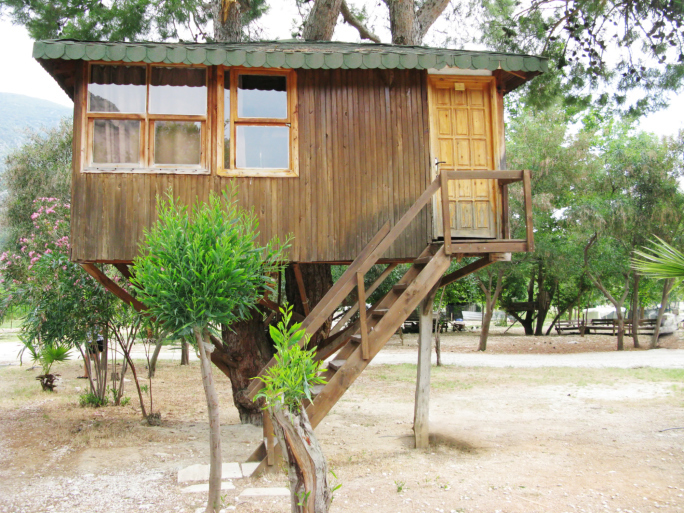 Sturdy tree house built using a tree and stilts. The light is a nice touch for camping out. Extensive tree house high up in the trees with large deck. 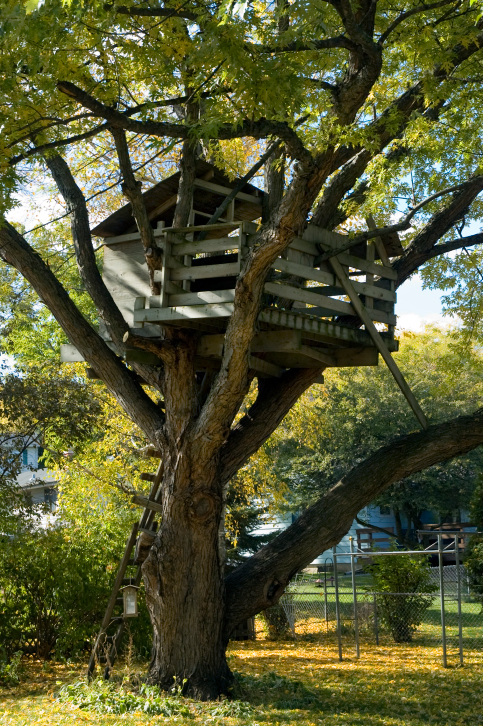 Small tree fort with large deck built way up high in tree branches. Solid wood tree house built with round logs supported by a tree stump and wood posts. Towering tree house perched on top of a tall tree. Simple tree fort built in the crook of tree branches of a large tree. More of a deck with roof built up using 3 large trees for support. 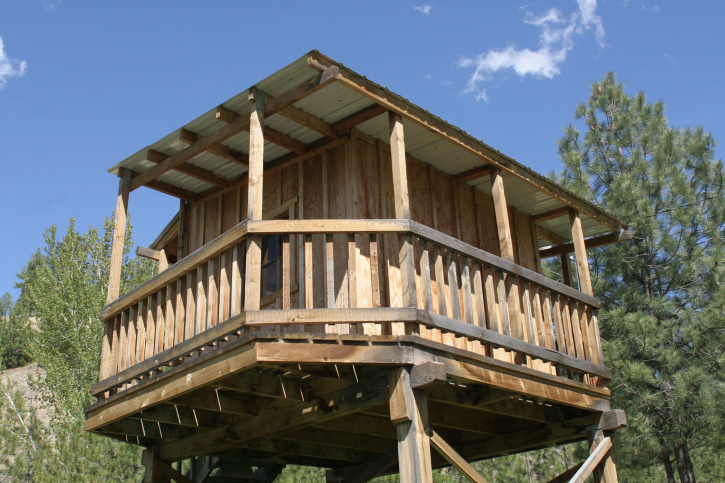 A yurt-style tree house built around one large tree with wrap-around deck. 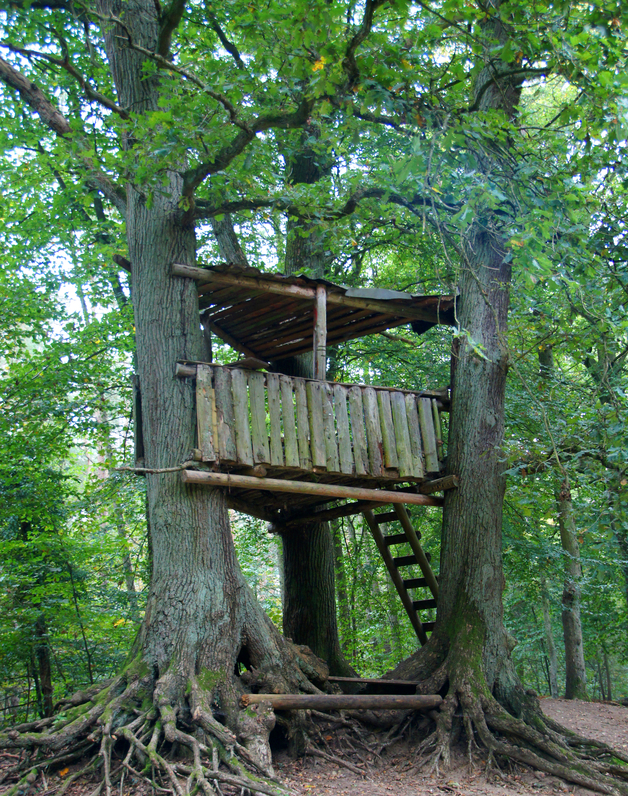 Photo of a large tree house professionally built around one large, sturdy tree. 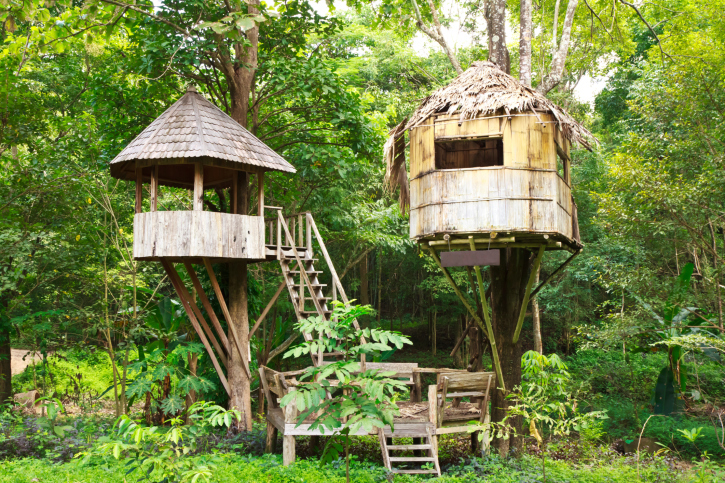 The following 3 tree houses could very well be lived in by adults. They’re much more elaborate. 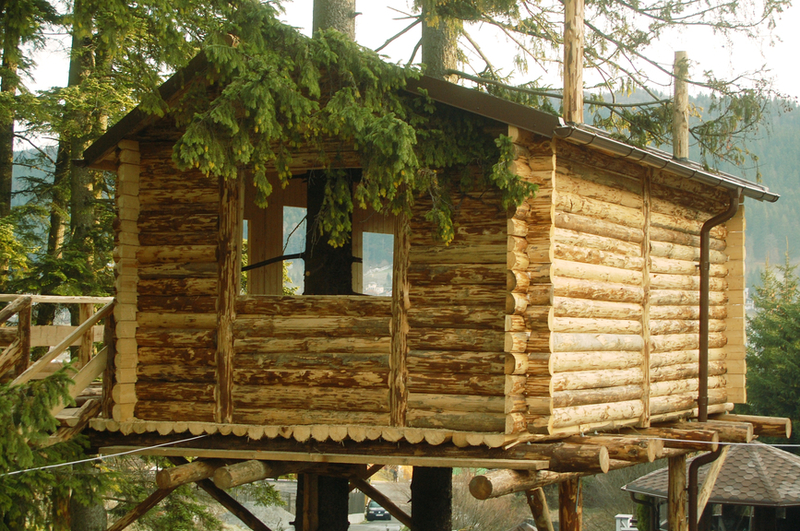 Many people throughout the world live in homes on stilts and even built in trees. 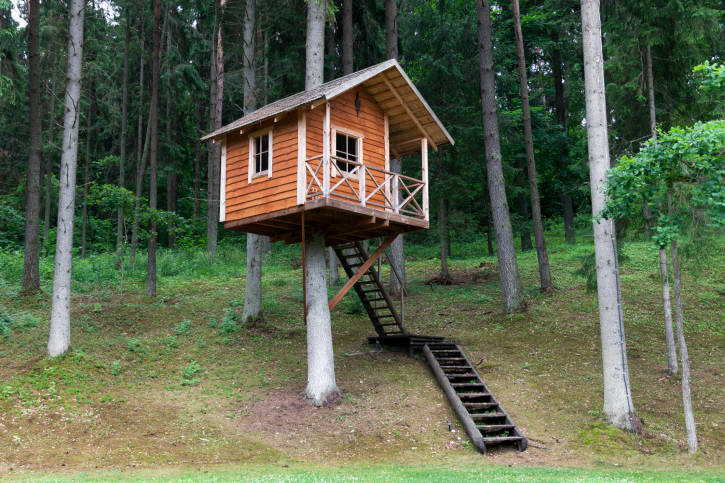 Tree houses are also fun for adults – some building them as vacation homes. 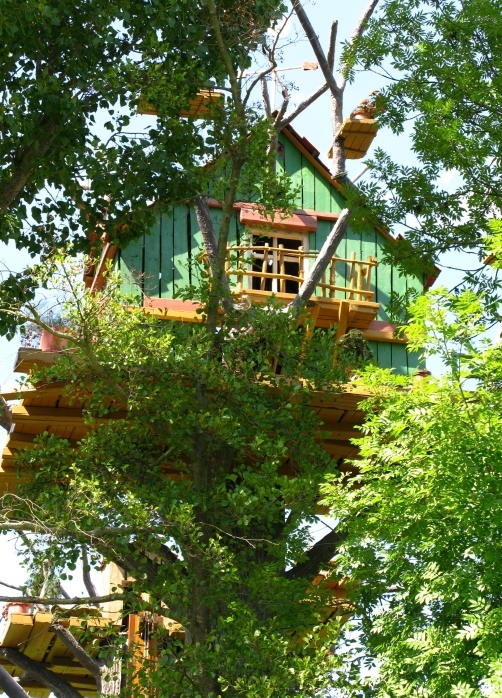 Adult tree house built in the tree canopy with large sun deck. Can’t get enough of the rustic look of log homes? Don’t miss our special gallery! 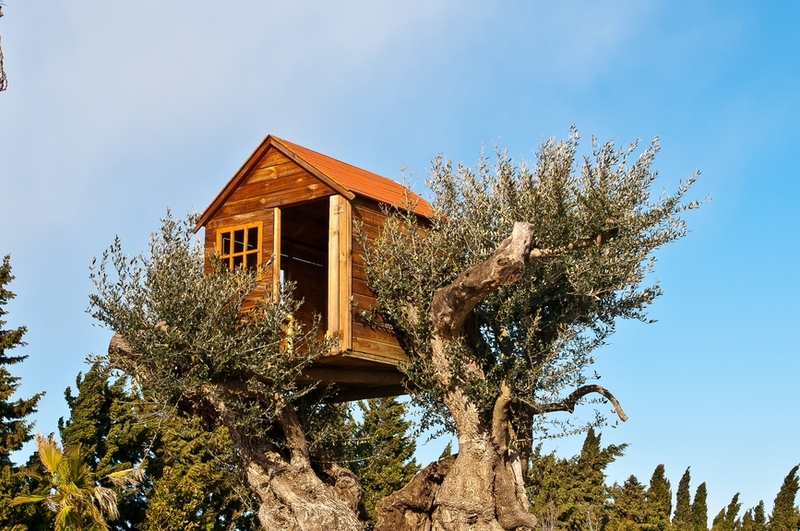 I’ll end this gallery with a literal tree house; that is a tree built in a tree. Actually, it’s cement and obviously part of a kids’ fun park, but it’s another approach to building a fun playhouse for kids if you have a large stump in your neck of the woods. House built inside of a tree trunk. 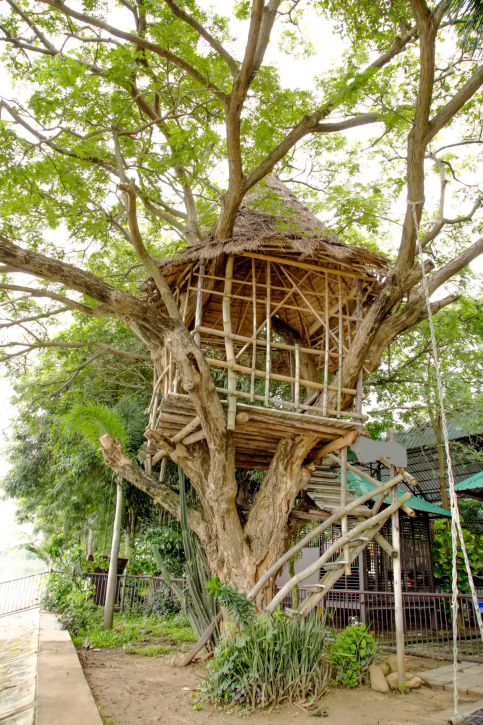 Actually, it’s a cement structure, but it’s included as a different approach to building a tree house… that is building it inside of a large dead stump.